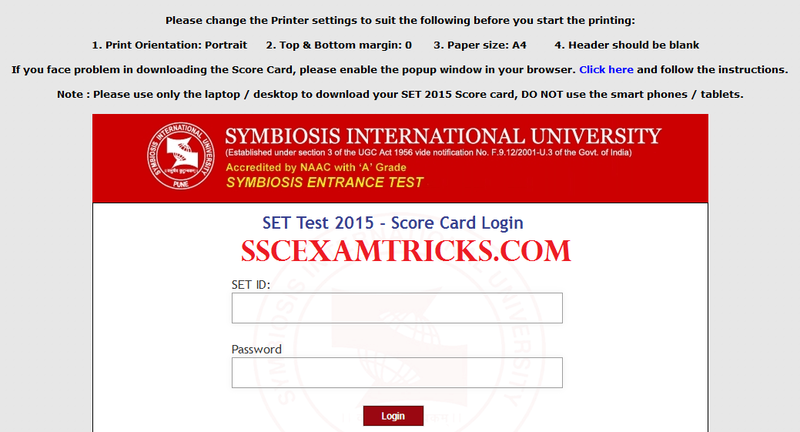 Symbiosis International University (SIB) had successfully conducted entrance exam on 02nd May 2015 in two sessions i.e. Morning from 09:30 AM to 12:00 Noon and Evening Session from 02:30 to 04:00 PM at various centres for getting admission in undergraduate Institutes of Symbiosis International University established as under Section 3 of the UGC Act 1956 vide notification No.F.9.12/2001 U.3 of the Govt. of India. In the year 2002 there were 3 constituent Institutes of SIU. Subsequently ten more Institutes of Symbiosis have been brought under the ambit of Symbiosis International University vide notification No.F.9.12/2006-U.3 (A). A huge numbers of candidates had appeared in this written examination and waiting for online result. 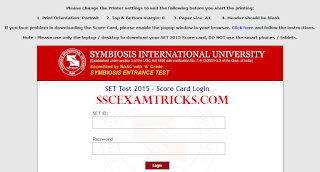 The latest news is that SET Result 2015 declared or SET scorecard of entrance exam released on 18th May 2015 after 12:00 Noon on official website. Those candidates who had appeared in written examination and waiting for their result, they can download their online result / scorecards / marks details from the direct link provided below. · Enter SET ID and Password.